This is the first volume of a projected four-volume edition of the select correspondence, speeches, and documents of Robert A. Taft(1889-1953), son of President and Chief Justice William Howard Taft. 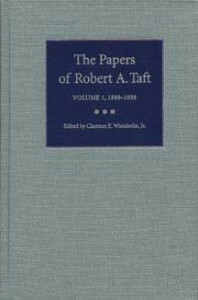 The series makes available key documents of Taft’s career, Ohio and Midwestern history, U.S. political and diplomatic history, and the study of conservative political theory. And it sheds light on one of the few political dynasties in U.S. history. Robert A. Taft began his public career in the Republican party of his native Cincinnati and later worked in close association with Herbert Hoover during the First World War. He was a successful attorney married to Martha Bowers Taft, a prominent civic leader and successful political campaigner whose influence helped secure him a seat in the U.S. Senate. Volume I spans Taft’s early life and career from his school days to his election to the U.S. Senate in 2938. Selected for inclusion are political speeches and other historically significant documents dealing with subjects of particular interest to Taft, such as taxation, federal housing, aid to education, and global military commitments. Clarence E. Wunderlin Jr. is professor of history at Kent State University. He is the author of Visions of a New Industrial Order: Social Science and Labor Theory in America’s Progressive Era and coeditor with Larry I. Bland and Sharon R. Ritenour of The Papers of George Catlett Marshall, Volume 2.